For over twenty years, we’ve been enjoying visiting Barboursville Vineyards. We only get there once a year, so we look forward to the visit and have never been disappointed. Our visit last month was memorable because we experienced a unique tasting. 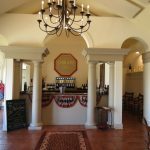 The winery has created a library tasting room and offer tastings on the weekends of their reserve wines. 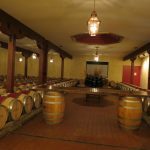 Visitors to the library tasting room are treated to a walk through the Octagon Room, where the barrels of that special wine reside. 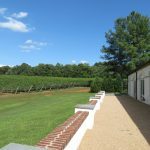 When you enter the tasting room, the first thing you notice is the impressive view through the many windows overlooking rows of Cabernet Franc vines with the Blue Ridge Mountains in the distance. Guests are given tastes while seated at tables. Special foods are offered along with the reserve wines. 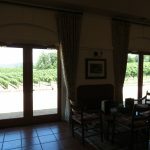 After a flight of tastings that include some of the most amazing vintages of Octagon, you can purchase a glass of wine, relax, and enjoy the ambiance. 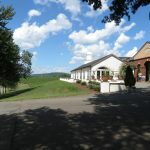 Barboursville Vineyards is one of those special wineries where the high quality of every wine is evident, even those you don’t particularly enjoy. Personally I don’t like Viognier (a white) or Merlot (a red) wines, because I don’t like the flavor of the grapes. 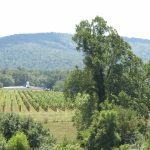 Barboursville’s Viognier Reserve and Merlot Reserve are both exceptionally well-made and I can recognize and recommend them to someone who enjoy those varietals. I would actually recommend any of their wines, but my favorites are the Octagon, Nebbiolo, Barbera, Cabernet Franc, Sangiovese, Sauvignon Blanc, and Vermentino. My husband also loves the Petit Verdot. 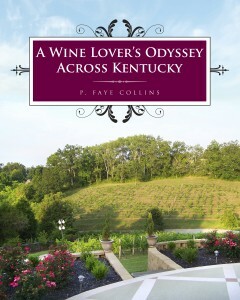 A visit to Barboursville Vineyards is always great, can’t wait till next year!